*I'm currently on vacation in the sunny Caribbean! This is a scheduled post (I sure hope it actually posts). I don't have Internet access so I won't be able to comment back as I usually try to do. Thanks for visiting though and hope you enjoy the review! One cold night, in a most unlikely corner of Chicago, two teens—both named Will Grayson—are about to cross paths. As their worlds collide and intertwine, the Will Graysons find their lives going in new and unexpected directions, building toward romantic turns-of-heart and the epic production of history’s most fabulous high school musical. The Good: Will Grayson, Will Grayson is a book that will stay in my head for a long time. John Green and David Levithan created two boys I related to, felt for, and liked. John's Will Grayson is a pretty typical teenage boy. He's prefers to be in the background, stay as detached from people as possible, and is unsure of who he is or what he wants. 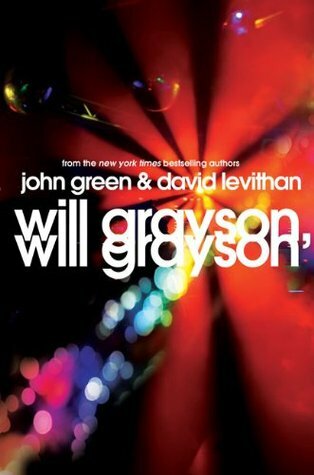 David's Will Grayson is a depressed, in-the-closet gay teenager for whom nothing seems to go quite right. The Will Graysons meet randomly one night in Chicago and their lives become quickly linked. The link becomes Tiny Cooper, John's Will's best friend, a physically gigantic, joyful, emotion-ful, gay teenager. Tiny brings David's Will out of the closet with a whirlwind romance. Tiny tries to bring John's Will more into the center of life - hooking him up with girls, making him a vaguely disguised character in Tiny's musical, etc. Will Grayson, Will Grayson is the first book in awhile where I wanted to write down quotes because they were just so insightful or meaningful Most of these quotes come from John's Will, my favorite character. He is basically a male version of myself. One paragraph that particularly affected me: "The part I enjoy most is not the doing, but the noticing...I just want the pleasure of noticing these things at a safe distance - I don't want to have to acknowledge that I am noticing. I don't want to talk about it or do stuff about it." David's Will is also a great character. I didn't always like being in his head, because he's always so miserable. I liked him in spite of himself. His feelings are so raw throughout the book that I kept wanting to reach into the pages and hug him. And slap anyone who hurt him in any way. Many reviewers thought Tiny Cooper was the best character in the book. Tiny is a fabulous literary character - he basically functions as the back-bone of the book - but if he was real, he would drive me up the wall. He is a fixer - he constantly meddles in people's lives and tries to make them happy. He seemingly loves people's "need" more than he loves people themselves. Another thing I loved about Will Grayson, Will Grayson are the parents. John's Will comes from a unique family in the YA realm: he has two happy, mentally-healthy parents who adore him. The stereotypical "traditional family" is quite the minority in YA lit; it's nice to see it represented occasionally. I love that John's Will's parents spend time with him and try to understand him. When he has a bad day at school, his dad comes home from work just to be with him. And the mother of David's Will is just as wonderful. She loves her son and hates seeing him so unhappy. She is someone that Will can and does rely upon for advice and consolation. When he comes out to her, she doesn't even blink. Instead, she welcomes Tiny into their home and cook dinner. The bad: I had so much trouble getting through this book. This happens sometimes with more literary novels: I appreciate the book but don't always enjoy it. I actually did enjoy this book. Every page made me stop and think, smile and laugh, or cry and despair. But despite that, I had to force myself to read each chapter for the first half of the book. The second half was, thankfully, much harder to put down. Part of the difficulty, I think, was due to David's Will. He's in so much pain and is so bitter that his chapters were hard to read. But I can't completely put a finger on why I struggled so much. I am very happy that I stuck with the book. It was a memorable, enjoyable, thoughtful read. I love when books stick with you even when it seems like you didn't enjoy them at first. Sometimes my favorite books are not the ones I instantly love instead it's the books that still have me thinking about them months after I've read them. I thought the same thing about this book when I read it. Really fantastic review Alison, I love how you split it up to the good and the bad for you, and even though you're not sure why you had so much trouble with it, the things you mentioned make complete sense. I struggle with the more literary books as well and as interesting as this one sounds, I think I might pass on it for now. I'm glad that you gave this book a shot and I agree, that it is not for everyone. There are lots of great quotes in this book and I hope to reread and take note of them. I can also see how Tiny can be annoying, but for me, I think his overwhelming goodness trumps his flaws. I could see how the chapters for Will #2 would be difficult to read. I actually didn't like him at first, but eventually he became my favorite of the two Wills. I really enjoyed this book. I'm glad you did too! I enjoyed this book too, and for almost the same reasons as you! I was not too bothered by Will #2's chapters, although I really felt down while reading those...maybe that's what David wants us to feel while reading his chapters, uncnsciously we're empathizing with Will #2? Really great review! Haven't read this yet but now you've got me wondering if I'll like both Wills or not. I hope I do! I loved this book, but I agree David's part was a little hard to get used to at first, but I love both of their writing. John, I like his voice, and David, I love how he ignores convention. Combine them together and it's awesome. I hope they do another book together. This was an awesome review. I loved thoughts on the book. I really liked your comment about Tiny loving people's needs more than the people. THis book is on my top to reads. I really want to get my hands on it. (Amoung so many more.) Nice review, it has me wanting to read it even more :) thanks for that. Please do stop by for a spot of tea or to browse over my new Steampunkery review up... Clockworks and Corsets. Forbidden Steam Adult- even the Mad Scientist gets naughty! oh man i want to read this one! i ADORE John Green, and your thoughts on it being a challenging - yet rewarding - read make me want it all the more! I LOVE Twilight and I am NOT ASHAMED!